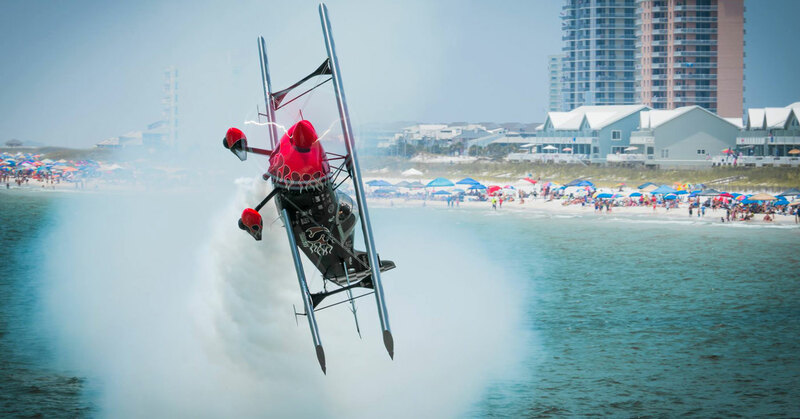 Like a streak of blazing lightning from an ominous sky, air show performer Skip Stewart blasts into view in a high-flying aerobatic symphony. You won't get thunder after that lightning, but you will hear an ear-splitting roar that will shake the ground as thousands of fans cheer their lungs to pieces. If a plane could be constructed of pure badassium, it would be called PROMETHEUS. PROMETHEUS brings the flaming fury of Skip's gyroscopic and brain-melting maneuvers. 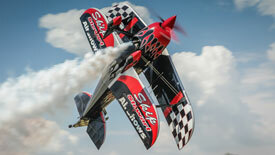 A modified Pitts S2S, PROMETHEUS is going to be the reason your throat hurts from cheering the day after the show. 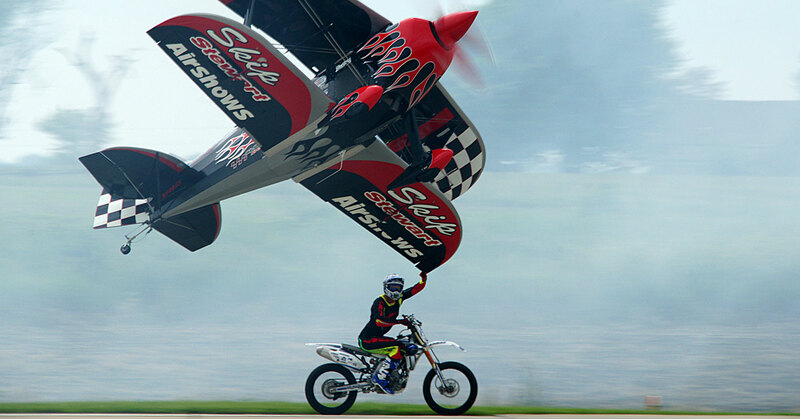 Some airshows look great – Skip's airshow is something you feel like a thumping, ripping drumbeat in the center of your chest. You'll taste fuel, you'll smell victory. 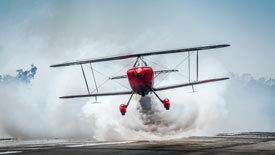 High-performance, high-skill, and high "totally-awesome," Skip and his plane will tear through a high alpha pass on takeoff, then proceed to rock the most jaw-dropping maneuvers down to 1-foot off the ground. PROMETHEUS doesn't specialize in haircuts, but get ready for a close shave. Skip Stewart can race cars. Not impressed? 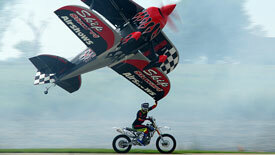 Skip Stewart races cars in a stunt plane flying so low he could honk the horn with his landing gear! 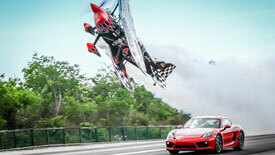 Zipping just inches above the road, Skip and his flame-bedecked PROMETHEUS perform eye-searing moto acts during his airshow that will leave you holding your breath. 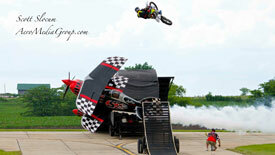 If that's not enough, Skip's airshow even takes on the classic motorcycle jump – except this time the motorcycle is jumping through the air just as PROMETHEUS flies beneath it like a mad man's fever dream. 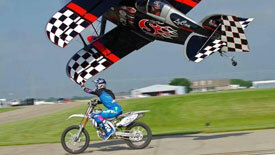 The roar of the engine as he skims the ground will make your heart do a backflip inside your chest. The grand finale of grand finales, the headliner, the showstopper: we give you Tinstix... Multiple airplanes streak the skies, going head to head to head over the saucer-sized eyes of thousands of awe-struck fans. Skip Stewart rides into glorious battle aboard PROMETHEUS, the giver of fire. 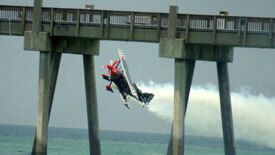 Next comes the Edge 540 with US Aerobatic Team Member Melissa Pemberton at the reins. 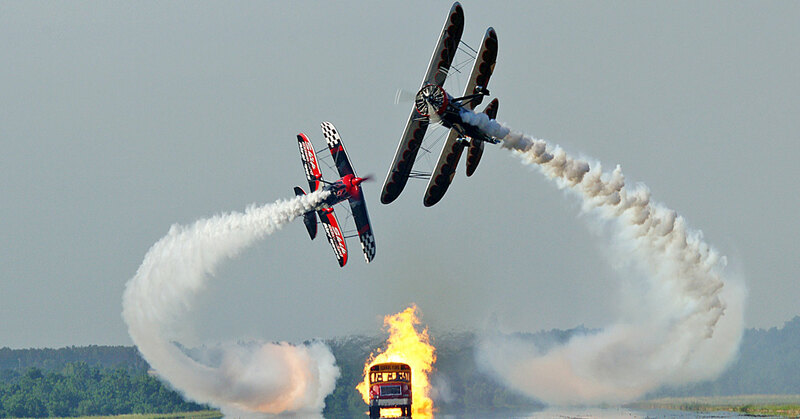 Pyrotechnics outline the battle above in a raging concerto of unholy fire, all while a Jet Truck holds the line on the ground against the wild aircraft. Walls of fire, noise like the sky being torn in half, a horde of airshow fans blown away by the sheer audacious courage: The Tinstix Act is the best kind of mass hysteria.